Risa Iwai is a Japanese pianist, born in 1985. She has won numerous prizes in Italy and has a flourishing career as a concert pianist and teacher. This is her first recording and so should be considered as a calling card. Her choice of repertoire is very adventurous, neither work being common choices for a debut disc. Schumann’s three piano sonatas have some splendid ideas and passages, but as wholes are not among his most successful piano works. His idiom, developed through short character pieces linked in cycles, did not fit easily into the sonata form and all three sonatas tend both to be episodic and to have long passages of repetition: the classical idea of development was alien to his musical imagination. This third sonata is the most problematic of the three. Schumann originally drafted it in five movements, with two scherzi. It was written in such a grand manner that his publisher persuaded him to title it Concert sans orchestre, for which Schumann revised the first movement and removed the two scherzi. In a second edition he put the first movement back to its original form and restored one of the scherzi. That is the version we have here. It is unfortunate that the title Concert sans orchestre is still sometimes used for this work, because there is nothing concerto-like about it, unlike Alkan’s Concerto for solo piano of 1857. I was impressed by Rosa Iwai’s performance of this work. It is of great technical difficulty and, in addition, the pianist needs to try to disguise the weakness in form. Her solution is, somewhat paradoxically, to underplay the grandeur and concentrate on speed, lightness and dexterity. Her technical command is indeed prodigious, as it needs to be: the finale begins with the marking Prestissimo possibile but Schumann then twice asks for Più presto. Of the other movements the first is assertive but somewhat rambling and the surviving scherzo is clumsy and insistent, but the slow movement, a set of variations on a theme by Clara Wieck, then Schumann’s apparently unattainable beloved, but later his wife, is charming and charmingly done. Incidentally this was a favourite encore piece for Horowitz. The competition for this work includes an outstanding version by Demidenko (Hyperion CDA66864), who plays with passion and intensity as well as phenomenal accuracy. He also includes the discarded scherzo and a variation for the slow movement which Schumann also discarded. Pollini has also recorded this work (DG 4790908), but in the first version. He displays his sovereign command, but Demidenko is the one who almost succeeds in persuading me that the work is a masterpiece. It is good to see Medtner beginning to take his rightful place next to his friend Rachmaninov in recitals. The Sonata-Ballada is a programmatic work, based on a poem, which describes Christ’s temptation in the wilderness. The first movement describes the arrival of spring. The second introduces Satan the tempter but his malevolent theme is gradually overcome by a radiant one, representing angels. In the last movement, after a rather Beethovenian fugue, there is a joyful statement of the angel theme with a background of bells. 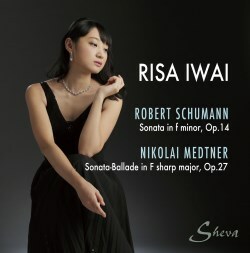 Risa Iwai conveys the musical narrative well, lightening her tone to prevent the complex textures from becoming heavy. However, she does not sufficiently bring out the themes, which I think should soar above or resound below the figuration. I find more incisive characterization in Hamelin’s performance in his complete set of the Medtner sonatas (Hyperion CDA67221/4). Risa Iwai is well recorded in a German studio. The notes are skimpy in the extreme, telling the reader almost nothing about the works and very little about the pianist. They are given in English and Japanese only. The disc would have had room for another work. Despite my reservations this is an interesting coupling and Risa Iwai’s formidable technical skill and fluency is much to be commended.